The Government has been accused of deliberately hiding the true scale of the €99m capital projects budget cutbacks caused by the children’s hospital crisis after failing to detail the exact areas now on the chopping block. Pictured are Minister for Health Simon Harris and Minister for Finance Paschal Donohoe commenting to media outside Government Buildings yesterday. Photograph: RollingNews.ie. 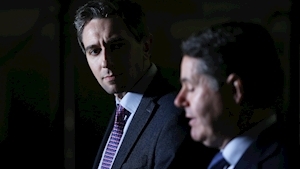 Opposition parties lashed out after Taoiseach Leo Varadkar, Finance Minister Paschal Donohoe and Health Minister Simon Harris stopped short of providing any clear, grassroots information on which projects will be targeted. In a bid to bring the runaway children’s hospital costs under control, on Tuesday cabinet signed off on €99m worth of cuts to its capital projects budget for this year. However, despite the need to ensure the public is fully informed of the scale of the changes, Taoiseach Leo Varadkar, Finance Minister Paschal Donohoe and Health Minister Simon Harris failed to outline the exact details involved. Announcing the plans in the Dáil, Mr Varadkar claimed the €27m Derry to Dublin motorway delay is the fault of the Stormont stalemate in Northern Ireland, and said the €10m national forensic science lab payment “can be deferred”. However, despite an expectation Mr Donohoe would reveal the full cuts details, he failed to do so at a later Government Buildings press briefing. After denying when asked that he is trying to sell the public “a pig in a poke” over the failure to fully reveal the cuts, Mr Donohoe later said in response to criticism he is being vague for political reasons that he is giving as much information as he can “at this time”. In a statement last night, Mr Harris was similarly vague, with a spokesperson saying the €24m “re-profiling” will be “restricted to delivering some smaller capital works such as repairs and replacements”. The spokesperson said “we are not talking about delaying or deferring any hospital project, any primary care centre and we are not talking about any community nursing unit”, but failed to give any real information on what the cuts involve. Opposition parties lashed out at the vague response last night, accusing Government of trying to pull the wool over the public’s eyes. They included Labour health spokesperson Alan Kelly, who warned the Government is trying to drip-feed information. Paschal Donohoe has many questions to answer when it comes to why we are now in the position where projects will be put on the long finger. Minister Donohoe has completely damaged his own reputation as being responsible when it comes to taxpayer’s money by keeping his eye off the ball on this project. “I’ll be pressing for both Minister Harris and Minister Donohoe to provide a list of what capital projects are being put on the back burner,” he warned.